1. On the PPro8 toolbar, click HistoryLog. 2. The History Log window appears. 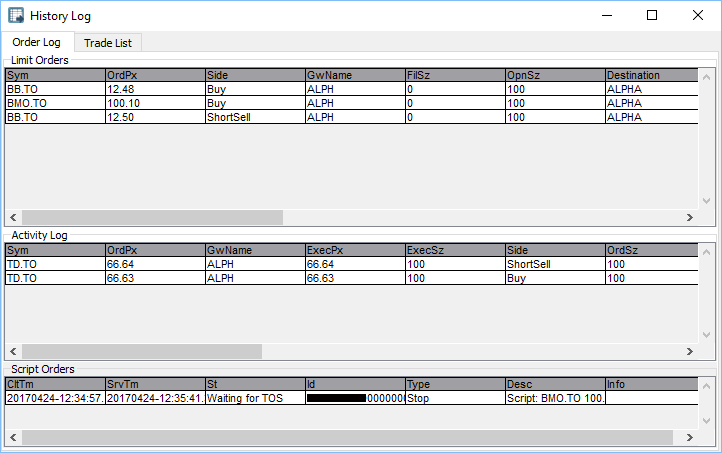 The History Log window contains two sub-tabs: Order Log and Trade List. Use the Order Log window to view the order log for orders placed on the current trade date. Copy Cell to Clipboard: copy the content in any cell to clipboard. Copy Row to Clipboard: copy the selected row of data to clipboard. Order Log Customization Dialog: open the Order Log Customization window. Print Activity Log: print the activity log. Export Activity Log: export the activity log to CSV file format, which can then be imported in Excel for further review and analysis. The Order Log window has three components: Limit Orders, Activity Log, and Script Orders. i. Limit Orders: view limit orders pending execution. ii. Activity Log: view all order activities (orders sent, filled, partially filled, canceled, or rejected). iii. Script Orders: view all script order activities. Use the Trade List window to view trade execution history for the current trade date. Note: the foreground and background colors in each row are customizable for all order states: Buy, Sell, Short Sell, Reject, Cancel, and Error. Note: orders rejected by PPro8 due to pre-trade checks appear as errors. Use this function to maintain your current limit order's price and time priority, while you have an opportunity to reduce its size. Note: before you can use this function, your order must first be accepted. 1. Click a row in the Limit Orders section to select it, right-click the row to open the shortcut menu, and then click Cancel Replace. Or, click a row, and then press Ctrl + R.
2. The Cancel Replace window appears. 3. Type or click the replace size, and then click OK. Note: it is only possible to set a smaller replace size (lower number of shares). The order number cannot be edited, and it is not possible to reduce below Lot Size value. 4. The cancel replace order is sent. Use this function to modify all aspects of the order while it loses price and time priority. This creates an entirely new order. 1. Click a row in the Limit Orders section to select it, right-click the row to open the shortcut menu, and then click Cancel and Send as New Order. Or, click a row, and then press Ctrl + N.
2. The floating Order Edit Box appears. Note: the window title includes the symbol name, function (in this case, canceling), and order number for your reference. 3. Type or click the parameters (Gateway, Side, Destination, Order Type, Reference Side, Limit Price, Shares, TIF, Reserve, Display Size, and Minimum Size) you want to set for the new order. 4. Click Execute, or press Enter. 5. The original order is canceled and the new order is sent. Use the AutoCancel options to automatically cancel the order while it gets filled. 1. Click a row in the Limit Orders section to select it. 2. Right-click the row to open the shortcut menu. 3. Click Set AutoCancel on Fill to automatically cancel the order when it's filled. Or, click a row, and then press Ctrl + 1. 4. Click Set AutoCancel on PartialFill to automatically cancel the order when it's partially filled. Or, click a row, and then press Ctrl + 2. 5. Click Set AutoCancel off to turn off automatic cancels. Or, click a row, and then press Ctrl + 3. 6. The AutoCancel options are set. To make changes to the Order Log settings, right-click anywhere in the blank space of the Order Log, and then click Order Log Customization Dialog or press Ctrl + O, to open the Order Log Customization window. This window displays four tabs on the left: Options, Columns, Colors, and Fonts. Use the Options window to set the options for the Order Log. Click the Options tab to open the Options window. 1. In the Options window, click an item in the Selected items list. 4. The item is hidden from the Order Log. 1. In the Options window, click an item in the Unselected items list. 4. The item appears in the Order Log. 1. In the Options window, clear the check box(es) for the Scroll Bars, Grid Lines, or Header option. 3. The item(s) are hidden from the Order Log. 1. In the Options window, select the check box(es) for the Scroll Bars, Grid Lines, or Header option. 3. The item(s) appear in the Order Log. 1. In the Options window, select the check box for the Link window to group number option. 2. In the value field, type or click a number. 4. The History Log is linked to a group of windows by number. 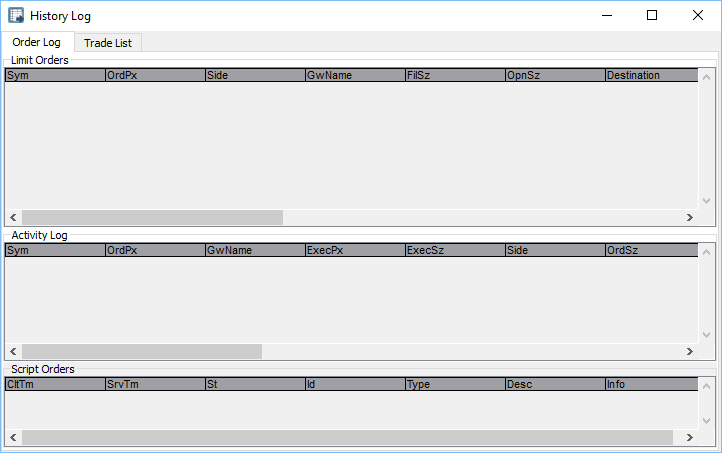 Use the Columns window to manage the columns that appear in the Limit Orders, Activity Log, and Script Order windows. Use the Limit Orders columns window to set the order in which limit order items appear in the Order Log. 2. Click Up or Down. 4. The item is moved in the Limit Orders section. Use the Activity Log columns window to set the order in which activity log items appear in the Order Log. 4. The item is moved in the Activity Log section. 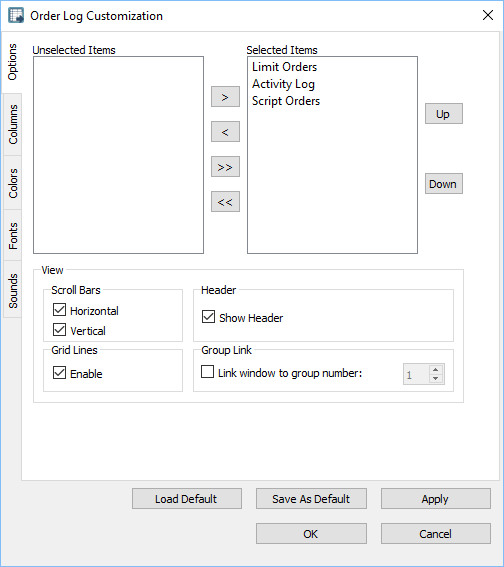 Use the Script Orders columns window to set the order in which script order items appear in the Order Log. 4. The item is moved in the Script Orders section. Use the Colors window to set the colors for gateways and pending symbols in the Order Log. Use the Gateway Colors section to set the background and foreground colors for the various gateways and order states. 1. In the Colors window, under Gateway Colors, click a gateway. 2. Double-click a color box. 3. The Color Selector window appears. Click a color, and then click OK.
4. The color is set for the gateway and order status. Select the Color Partial Filled check box to color partial fills. Use the Fonts window to set the overall font for the Order Log. Click the Fonts tab to open the Fonts window. 1. In the Fonts window, click Set Font. 3. Click the font, font styles, size, effects, and writing system you want to set. 5. In the Order Log Customization window, click OK.
6. The new font is set. 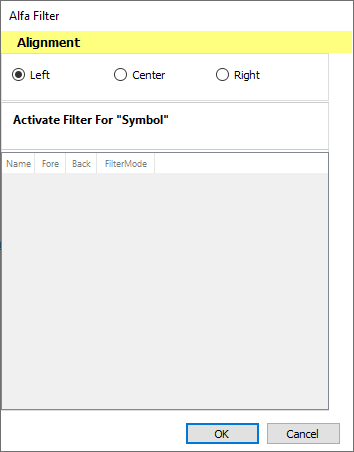 Use the Sounds window to set a sound alert for fills by symbol. Click the Sounds tab to open the SoundsConfiguration window. 1. In the SoundsConfiguration window, click New. 2. A new row appears. 3. Type a symbol, click a trigger type (On Fill or On Part Fill), and select a sound file. Note: to set a sound alert for all symbols, type *. * in the symbol field. To set a sound alert for a market, e.g., Nasdaq, type *.NQ. 5. The sound alert for the symbol is set. 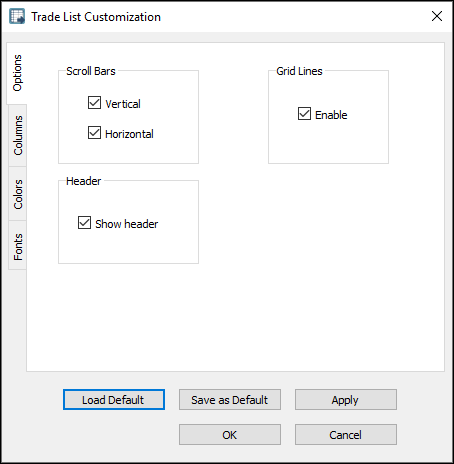 To make changes to the Trade List settings, right-click anywhere in the blank space of the Trade List, and then click Trade List Customization Dialog or press Ctrl + T, to open the Trade List Customization window. This window displays four tabs on the left: Options, Columns, Colors, and Fonts. Use the Options window to set the options for the Trade List. 1. In the Options window, clear the check box for an item that appears in the Trade List. 3. The item is hidden from the Trade List. 1. In the Options window, select the check box for an item that is hidden from the Trade List. 3. The item appears in the Trade List. 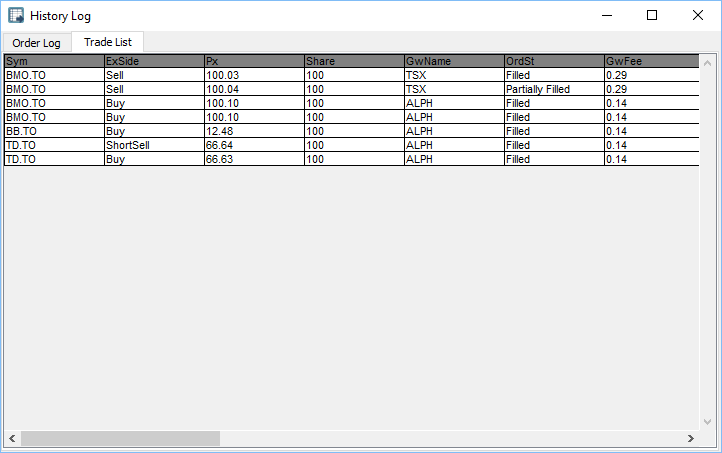 Use the Columns window to manage the columns that appear in the Trade List. 4. The column is hidden from the Trade List. 3. The column appears in the Trade List. Use the Colors window to set the foreground, background, gridline, and Header colors for the Trade List. 3. The color for the Trade List is set. Use the Fonts window to set the overall font for the Trade List. 5. In the Trade List Customization window, click OK.
Use the Alignment Editor and Filter Option to align columns to the left, center, or right, and to set a filter for the History Log window. 1. Right-click a column heading, such as Symbol, MarketName, PriceOrder, Side, State, SizeOrder, SizeFilled, SizeOpen, Gateway, Destination, AutoCancel, OrderID or ViaApi in the Limit Orders section, or ClientTime, ServerTime, State, ScriptID, or ScriptType in the Script Order section, in the History Log window.